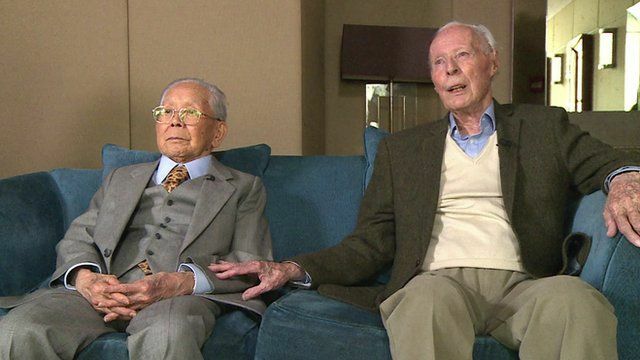 'Death railway' vets bridge old divisions Jump to media player Seventy years on, a British ex-POW who worked on the Burma "death railway" meets a Japanese soldier who employed his forced labour. How WWII POWs helped disease research Jump to media player Many prisoners of war held captive in Eastern Asia suffered with tropical diseases which their bodies had never been exposed to before. What life was like in World War II Jump to media player Martin went to the German Occupation Museum to see what life was like for a family living on Guernsey in World War II. Dresden 'night of fire' remembered Jump to media player Commemorations have been taking place in Germany to mark the 70th anniversary of the bombing of Dresden. Auschwitz survivors revisit camp horror Jump to media player Survivors have returned to Auschwitz to remember those lost and to be reunited with fellow captives, 70 years after the camp was liberated. Torpedo boat restoration under way Jump to media player A Somerset engineer spends a year working to restore a rare World War Two torpedo boat. Original WW2 Spitfire to be auctioned Jump to media player One of only two original Mark I Spitfires left in the world that can still be flown is being sold off for charity. It was one of the worst atrocities of World War Two - where Allied prisoners of war were forced by the Japanese to build a railway linking Thailand to Burma. It cost the lives of more than 100,000 people. Now, two men who worked on the railway as enemies have decided to meet for the first time after seeing a BBC documentary on the conflict which they featured in. One was a Japanese army engineer, the other, a British prisoner of war. The BBC's Graham Satchell takes up their story.